Counted Cross Stitch Kit with Chart, Embroidery Fabric: 100% cotton, Yarn: 100% cotton DMC, 7 stitches/cm - 18 count, Yarn organizer, Instruction in four/ eight languages, Large-square charted design, Needle, Frontsheet picture, ca. 8 x 12 cm / 3.2" x 4.8", Age category: from 10 years, Stitches: cross stitch, back stitch.. 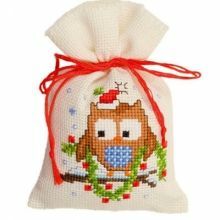 Counted Cross Stitch Kit with Chart, 3 Bags semi pre-finished, Embroidery Fabric: 100% cotton, Yarn: 100% cotton DMC, 7 stitches/cm - 18 count, Yarn organizer, Instruction in four/ eight languages, Large-square charted design, Needle - Frontsheet picture, Yarn to close the bags, ca. 8 x 12 cm / 3.2" x 4.8", Age category: from 10 years, Stitches: cross stitch.. Counted Cross Stitch Kit with Chart, 3 Bags semi pre-finished, Embroidery Fabric:44% Cotton,39%Viscose,17% Linen, Yarn: 100% cotton DMC, 7 stitches/cm - 14 count, Yarn organizer, Instruction in four/ eight languages, Large-square charted design, Needle - Frontsheet picture, Yarn to close the bags, ca. 8 x 12 cm / 3.2" x 4.8", Age category: from 10 years, Stitches: cross stitch, back stitch..